Joachim Low admits the poor form of German clubs in Europe this season is ‘alarming’ and has exposed weaknesses in the Bundesliga. Germany touched down in Belfast for Thursday’s Group C clash against Northern Ireland unbelievably never having lost a World Cup qualifier on foreign soil in 46 games and 83 years. But the match takes place against a backdrop of unrest in the German club game after Bayern Munich, Borussia Dortmund, Red Bull Leipzig, Cologne, Hoffenheim and Hertha Berlin lost all six games in the Champions League and Europa League last week. 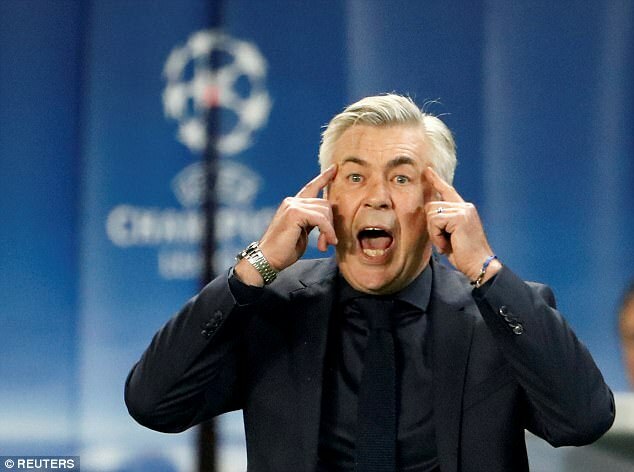 Indeed, the Bundesliga clubs have won only one of their 12 group games so far, with Bayern’s poor start costing Carlo Ancelotti his job. 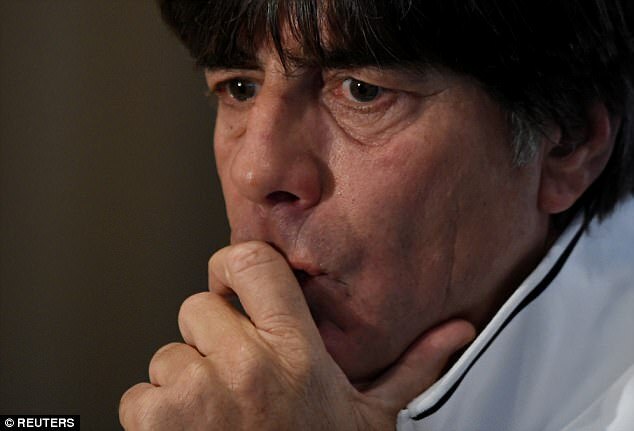 In an outspoken assessment of German football, Low said: ‘The weak performances of German clubs in Europe is hopefully just a momentary blip but it is alarming. ‘For a while now we’ve been thinking about how to improve things in the Bundesliga. It’s wrong to praise the Bundesliga to high heaven or say only the Bundesliga produces the best talent. That would be untrue and people who say this have been humbled by this experience. ‘We have to recognise this. We know this from sending scouts to European countries. We know there is talent all around the world and the Bundesliga isn’t the be all and end all. 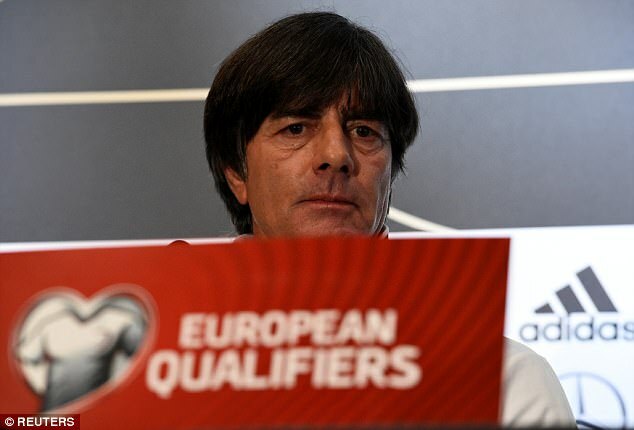 Low denied that the situation in Munich will affect some of his players coming into the international break. He added: ‘The situation has no physical effect either mentally or physically. ‘I have a sense of feeling in what mood players are in when they arrive, and I did not detect any tension in the Bayern Munich players. I’ve talked to them on the phone before this game. ‘Jerome Boateng is happy to be back and they are relaxed, know how to deal with the situation and many of them have been with top clubs for a long time throughout their careers. Boateng has described the international break as an ‘oasis of calm’ for the Bayern players but teammate Mats Hummels insists he has not been distracted by the problems at home. ‘It’s perfectly normal,’ said Hummels. ‘We’ve been in this business for quite a number of years, and while the last few days at Bayern Munich have not been easy, we’re in a completely different environment now. Germany and Northern Ireland are set to play each other for the third time in 15 months, having met at Euro 2016 and in the first group game in Hanover in October. 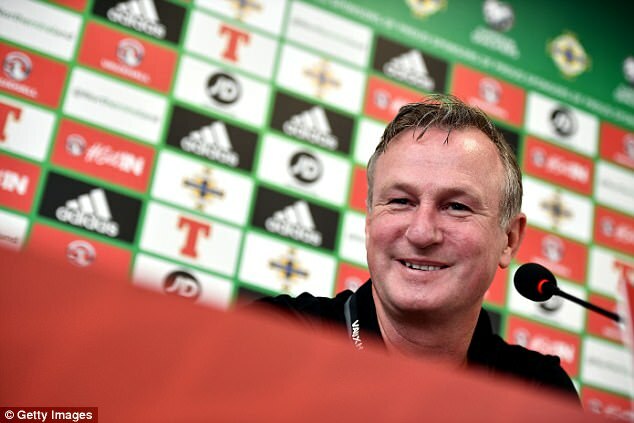 Germany won that game 2-0 but Northern Ireland have not conceded in almost nine hours of competitive football since then, winning a record five games in a row. Low added: ‘It does have the atmosphere of a final, with the first place against the second place team. 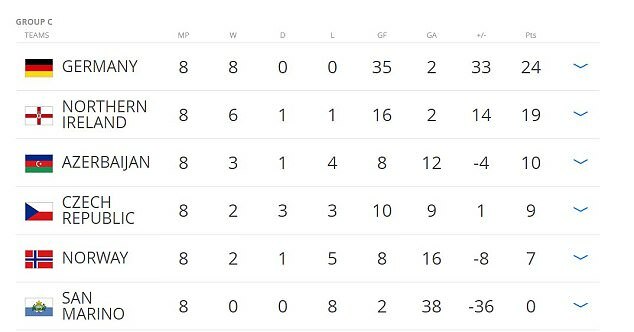 Northern Ireland have practically qualified and they can go top. They will not play all or nothing football, but they will definitely be risk-orientated because they have got nothing to lose. ‘We’re looking forward to this encounter. The crowd will be very boisterous and euphoric even. Northern Ireland have exceeded expectations in many respects but they are where they are by rights. They fully deserve what they have achieved. There’s a lot at stake and both teams know it. ‘They were the positive surprise at the Euros, even past the Euros, and kept clean sheets in seven matches. You only do that when you know what you’re doing. O’Neill has been training with eight players against six to prepare his players for being overloaded against the world champions. But he believes they should have nothing to fear at a packed Windsor Park. ‘We’ve presented the Germans as a formidable opponent but not an invincible opponent,’ said O’Neill. ‘An opponent that on any given night, there’s an opportunity for us to try and find a way to win the game, and certainly the players believe that. ‘We shouldn’t fear the outcome of the game. The players have done the work in this group, guaranteed second spot and put ourselves in really strong position for play-offs. Whatever happens will not take away from the campaign we’ve had, it will only enhance it if we put in a performance. ‘One of the most difficult things as an international manager is to create how the game is going to be. 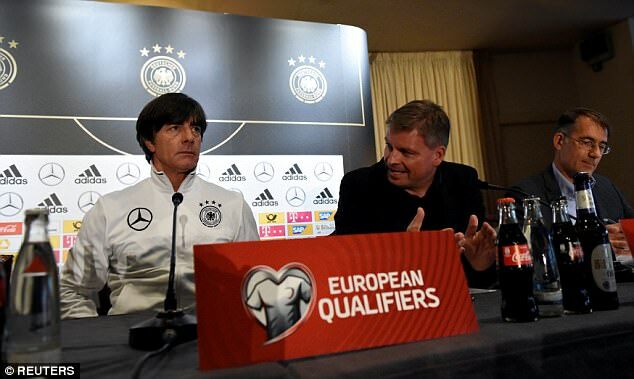 If I play my strongest team versus my weaker team, it’s not going to create how the game will be against Germany. It’s impossible. ‘We have to be clever in terms of how we set up training routines and recreate scenarios looking back at how the Germans play. ‘We did little things like 11 versus 10 and put conditions on players, different scenarios where we put conditions on the opposing team to make them play like Germany. ‘There’s no point in putting them out there and letting them play, we won’t replicate how the game will be. Whether it’s 10 v 8 or 8 v 6, all of that is based on being good without the ball and incisive with it.